Sherry Schmidt Watercolors: New Group! Well...a new-to-me group. The paint-out group is active on Facebook and I've admired the artists' posts for many months. Their weekend paint-outs are usually on Saturdays but I try to never miss painting with my long time Saturday friends. Last weekend the group had a paint-out scheduled for Sunday. The location was one I've driven past and wondered if it would be a good spot for painting. Elephant Hill! 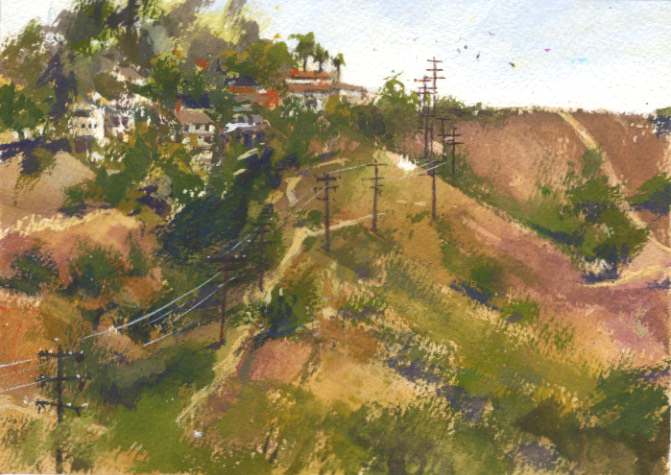 It's in the Monterey Hills, El Sereno area of Los Angeles. The over 100 acres remain open green space despite being sought by developers for decades. The group was a very welcoming to me and several others joining in for the first time. We had a great view overlooking the Elephant Hill area. I loved our hilltop vista of the homes and many trails criss-crossing the hills. Hi Sherry, area looks very typically SoCal, brings to mind my Catalina Island hills. Your gouache piece is really nice. Hi Jody! Thanks for such a nice comment.